Can Elite Marketing Pro Help You Generate Multi-Level Marketing Leads? Elite Marketing Pro is a online marketing training program that helps network marketers generate leads and start a home business. Similar to my top recommended program Wealthy Affiliate that has helped me start my small business online, Elite Marketing Pro is also a program that helps people achieve the same. Unlike Wealthy Affiliate that has no upsells, inside Elite Marketing Pro, there are many upsells that can cost up to a few thousand dollars. Ok, this does not mean Elite Marketing Pro is not a good program. Everyone has their unique need. Therefore my top recommended program might be suitable for me but might not be a good fit for you. To let you have a better view of what Elite Marketing Pro is all about, I've created this review so you can make better decision on whether this program is good for you. Here's my most updated and comprehensive Elite Marketing Pro review. How Does Elite Marketing Pro Works? How to Make Money with Elite Marketing Pro? Price: $27 all the way up to more than $4,000 per year. Summary: Elite Marketing Pro is a legit program that focuses to recruit members into promoting their affiliate program. But it is very costly and members need to buy into upsells to access more features. Elite Marketing Pro was founded by Tim Erway in April 2013, with the objective to empower today's network marketers with digital strategies to create the ultimate lifestyle business. As the name indicates, Elite Marketing Pro is a subscription-based network marketing program that provides online marketing training for home businesses or people who want to start an online business by becoming their affiliate. Like what was taught inside My Lead System Pro, Elite Marketing Pro also focuses to teach members Attraction Marketing formula. It simply means attracting customers by first offer value to build your brand and then promote products to make them buy. Below is a video that explain about this strategy. Whether you are a home business owner, brick & mortar or just someone who wanted to start a small business online, Elite Marketing Pro seems to have everything to back you up. Once you login to Elite Marketing Pro, you will be greeted by its founder at your member's dashboard before being lead to register for your free 1-on-1 coaching with your assigned coach. Whether you decide to go through this coaching or not, there is a Fast-Start Roadmap to guide you through step-by-step on how to setup your account, join the community, access to your products and learn information about EMP affiliate program. 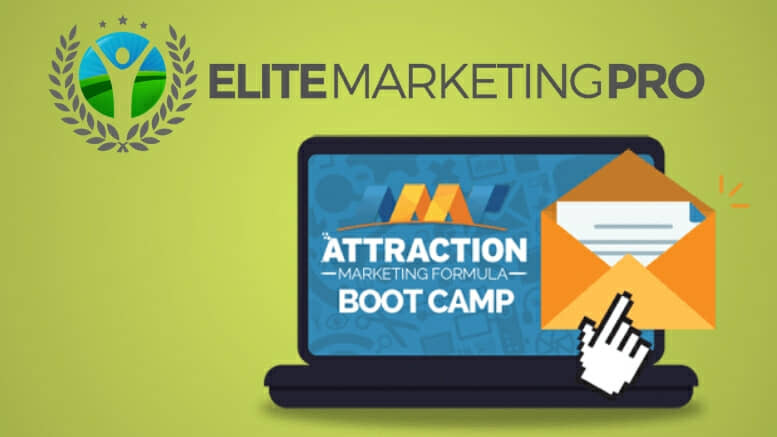 There is also another Program Roadmap (varies depending on your membership plan) that shows you in details what training or resources you will receive after joining Elite Marketing Pro. In general there are 2 main types of training, one is Ignition Coaching Program that focuses to teach you fundamentals about attraction marketing strategies and the other is Insider Training Hub with basic courses about online marketing. Ignition Coaching Program teaches you the fundamental of attraction marketing strategies and how it really works. These 3 levels of training can be broken down into 12 modules as shown below. Whether you have an existing business or planning to start by promoting EMP program, Insider Training Hub is a great place to learn specific online marketing tactics and strategies to grow your business, leveraging on the power of internet. 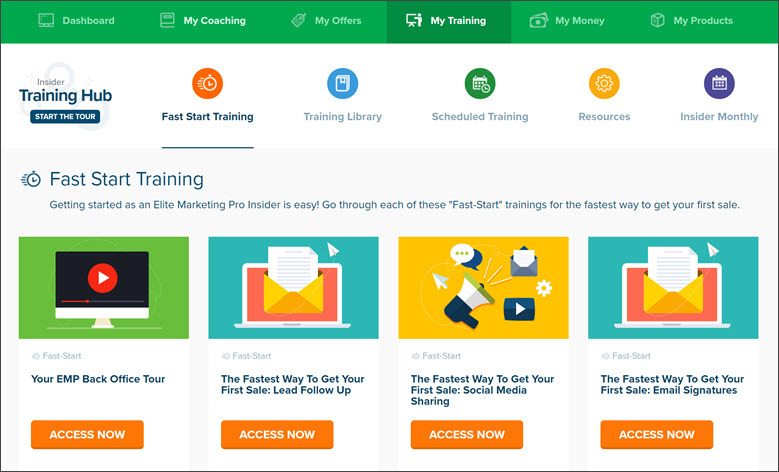 Fast Start Training: You can start with Fast Start Training if you do not have an existing business and want to start your first online business by promoting Elite Marketing Pro. Inside this training, you will get all the fast and simple tactics to start promoting your EMP affiliate link straightaway. 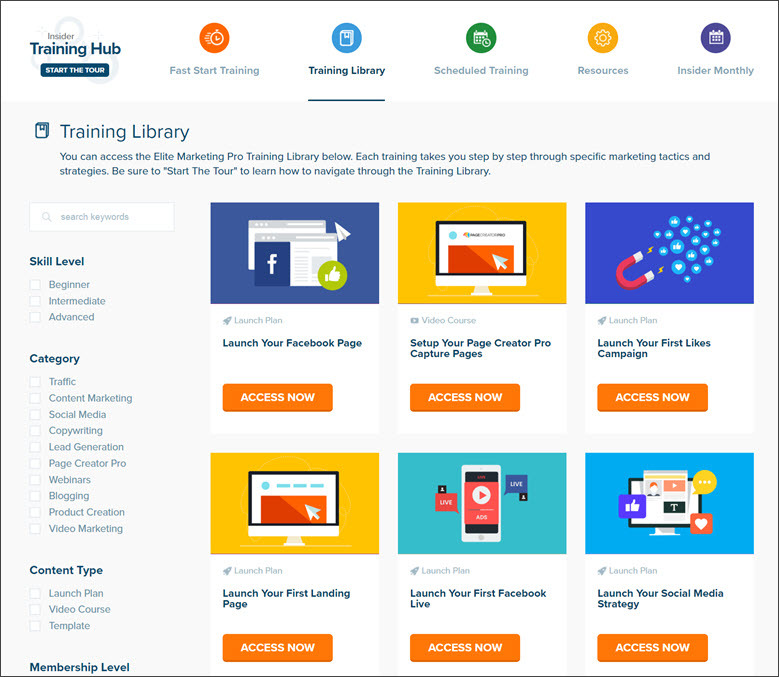 Training Library & Resources: If you have no plan to promote Elite Marketing Pro as yet, then I suggest you to jump straight to Training Library to search for online skills that you want to acquire. Inside this training, you can learn how to create a Facebook page, create landing page, create video and some other basic training you can find if you subscribe to the newsletter of some well-known internet marketers like Pat Flynn or Neil Patel or even search on YouTube. If you want more specified strategies, you need to pay more to gain access. I know it might be challenging for some of you to start writing email swipes, Facebook scripts and any writing that you need to do in order to share your offers on social networks. The Elite Marketing Pro understand your difficulty and therefore like other similar affiliate programs such as Sqribble, WP Profit Builder and CB Passive Income, EMP also provides you with all the scripts that are required for you to promote their program. I would say EMP spend more time designing their affiliate system than their training program. Unlike Wealthy Affiliate that focuses to teach members how to create high quality content, EMP only provides content training when you subscribe to VIP membership. Scheduled Training & Insider Monthly: As member of Elite Marketing Pro, you will gain access to 3 times weekly Q&A private consultation to see real-time how to create profitable ad campaigns and get tips from expert traffic coaches based on campaigns created by VIP members. You will also gain access to pre-recorded monthly video training on the most up-to-date sales conversion tips, techniques and strategies form various marketing experts. This is a newly introduced tool in 2018 to give members an option to create their own authority blogging site with lead capture pages. It is a great tool with all the essentials that you need to start an online marketing blogging business. However, their site builder is not optimized for search engine. Training and resources inside Elite Marketing Pro focuses on paid strategies and social media traffic. To monetize from this program as a complete newbie, you need to learn how to spend additional marketing dollars to run paid campaign. There is an affiliate program offered by Elite Marketing Pro with great resources and affiliate materials. Seriously, the training inside concentrates too much on teaching members how to promote EMP products. There is obvious lack of balance between the effort put into creating high quality online marketing training versus perfecting their affiliate system. If you are an existing business owner, I don't think Elite Marketing Pro is for you as there are too many affiliate resources that you won't be using. Of course, this is my personal opinion and might not represent majority of the people. I am not against programs having affiliate program or re-seller rights. I think it's a good system to have so it becomes another source of income for many people. But I really don't recommend programs that focus too much on reselling and promoting themselves. If you plan to promote EMP as their affiliate, the commissions you can earn will depend on your membership status as shown below. VIP Members earn a commission rate of 70% on sales of all standard products, monthly & annual memberships and 40% on sales of VIP memberships. Annual Members earn a commission rate of 40% on sales of all standard products and monthly & annual “Insider” memberships. (They are not eligible to earn commissions on sales of VIP memberships). Monthly Members earn a commission rate of 40% on sales of all standard products and monthly “Insider” memberships. (They are not eligible to earn commissions on annual and VIP memberships). Standard Affiliates earn a commission rate of 20% on sales of all standard products. (They are not eligible to earn commissions on sales of monthly, annual or VIP memberships). Members make most money by promoting products outside of annual subscription. These are mostly high ticket items that offer more advanced training. Elite Marketing Pro offers 2 types of membership, one is Insider Membership and the other is the more advanced membership which is VIP Membership. As Insider member, you can access to basic training but can't dive deep into each strategy. This membership offers all the features that I mentioned on the earlier section this post. Rather than paying for full year membership of $297, you can start with a 7 days trial of Insider Membership for only $7 with this link., thereafter pay $47 per month. Despite you can get decent features as Insider member, it might take longer time to make a living off this program as what was taught is only the basic. If you are really serious to start promoting EMP as a real business, I suggest you to join VIP membership. This is most probably the most value of all the membership. Here's what you will get. Most of the EMP products come with 30 days money back guarantee. However, if you have a VIP membership, you DO NOT QUALIFY for a refund once you start to get lead and earn commission, regardless of the value. Its refund policy is quite complicated. I would advise anyone considering to buy this product read the policy in detail as refund issue has caused quite a number of BBB disputes filed by its VIP members. No, Elite Marketing Pro is Not a Scam. 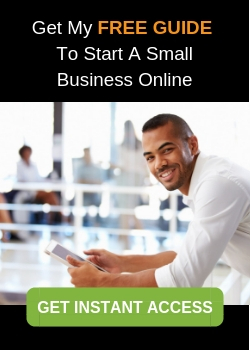 It pays on time and provides decent training for members to start a small online business. However, I won't consider to join this program because I am already making money with Wealthy Affiliate. If you are currently attached with any program that you believe is good, I suggest you to stay focused, give yourself some time and continue learning. Only by staying focus, you can really see results. Like me, I prefer to continue my business with Wealthy Affiliate despite discovering so many other programs such as Stack That Money and Power Lead System. Not that these programs are bad, just that the tons of training are confusing and the methods taught are not suitable for me. Of course, one of the main reason is due to the higher price tag which I am not ready to invest as of now. There are people who are willing to pay for such high ticket program and I guess they too have better ability to manage information overload. There is no perfect system in this world. You just need to find one and stick with it until you achieve success. 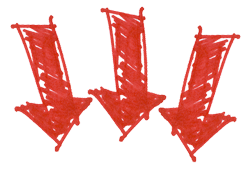 One downside of Elite Marketing Pro that I would like to mention here is the many expensive upsells they offer that promises to help you achieve results quicker. This is something you have to avoid regardless of how tempting the offer is. Remember, to excel in this industry, staying focus is a must. If you are a complete newbie, you might face challenges taking action on all the different marketing strategies that you learned inside Elite Marketing Pro. To solve this problem, my suggestion for you is to select one strategy, learn and dive deeper into it so you can excel with that particular strategy before moving to the next one. That's how I started with Wealthy Affiliate – focusing on one strategy, that's to create SEO-optimized content and get free traffic from Google. You can learn the exact step-by-step method I use to start my online business using my free guide. Inside this guide, I will show you proven strategy and lead you to get free training and tools to start your first authority blog. But if you want to start immediately, this is what you can do next. 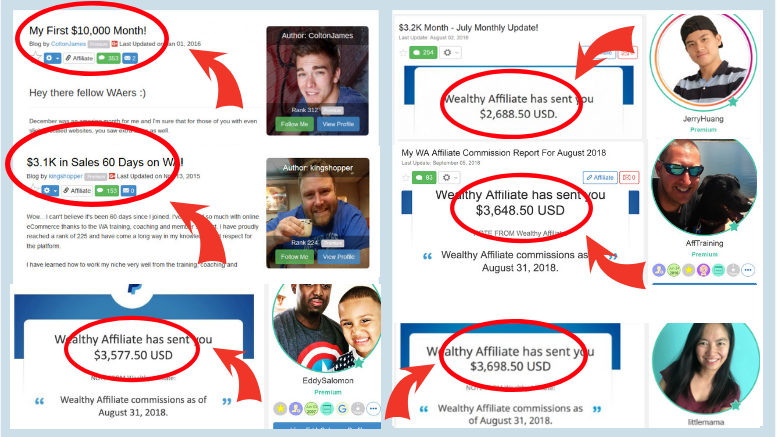 If you are like me, who is also a big fan of making money through blogging, then I highly recommend you to join Wealthy Affiliate. I cannot find any program that teaches blogging better than them. Inside Wealthy Affiliate, you can find the most up-to-date training about SEO, information about Google algorithm change and recommendations to optimize each change in order to continue getting free traffic. You might think I am bias when making this claim, but the truth is many members are making decent income with this program without paying anything on advertisement. Below are some income statement of Wealthy Affiliate members who started as complete newbies. Whether you decide to create text, video or podcast content to build your blog, you can find all the top notch content creation training inside this awesome affiliate marketing program. To give this program a try for free, make sure you grab your Wealthy Affiliate free trial right here, right now! 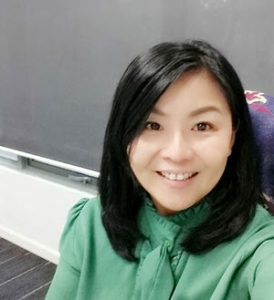 I hope my most updated and comprehensive 2019 Elite Marketing Pro review has given you in-depth information about how this network marketing program works. If you like this post, be sure to leave a comment below or share on your Facebook. What is The Online Marketing Strategy Naidy Phoon Claims To Work? 2 Comments on "Elite Marketing Pro (Most Updated Review in 2019)"
Thank you for reviewing the Eleite Marketing Pro website/program. When I look for online programs to learn from in my effort to improve my own online business I always look for reviews and comments from real people who have tried the program. Your review looks to be based on real experience so I will certainly take your experience with the program into consideration. Yes, I subscribe for their 7 days trial at $7 because I find this program quite interesting. 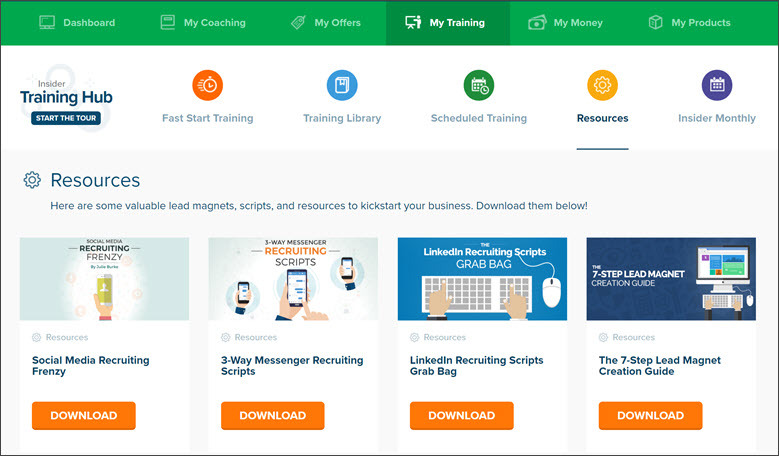 However, after going through member’s dashboard, apparently training provided is quite basic for someone like me who has some experience with lead generation. Unlike what was advertised by Elite Marketing Pro that this program is suitable for existing businesses, there’s not much training that cater for them. Not even a CRM tool that businesses need badly. If you own an existing business, I would advise you to join My Lead System Pro or Power Lead System. At least both provide CRM tool. Unless you subscribe for VIP membership to get advanced training, otherwise it’s difficult to generate additional leads for your existing business by learning from these basic lessons. But if you are a person who just want to promote Elite Marketing Pro program, then maybe you can try the Insider Package, provided you are ready to spend money on advertisement.